For two weeks in September and October, I again enjoyed the enchantments offered by our 50th state, Hawaii. For any of you who haven’t yet made these delightful islands your destination, I highly recommend that you do so within the next few months. You’ll return home a relaxed and changed person. My first stop was the garden island of Kauai and a visit with my friend, Louise. Louise stays in her lovely house there for two months of each year (August and September) and turns it over to her renters for the next ten months. This time I was there, along with another friend, Kay, for her last week in Hawaii, and it has been her habit to spend her last few days at her time-share at the luxurious Marriott Hotel, so this time Kay and I were able to join her at this perfect vacation spot. So that first day (Sunday), after spending a while at lovely Hanalei Bay relaxing on the beach and swimming (remember “Puff, the Magic Dragon” in the land of Hanalei), Kay and I helped Louise clean up and ready her house for her renters. We left Tuesday morning for the Marriott. We were given a suite on the ninth floor of the hotel, and our view encompassed the large sparkling blue clover-shaped pool below, plus the lovely beach beyond that. We had a large living room and large bedroom, each room with its own bathroom and roomy balcony. During our four-day stay there, we made full use of the refreshing pool with its abundance of lounge chairs and sunshine, and one day took an invigorating swim in the ocean. Each morning we had a great breakfast overlooking the pool, and then for dinner, we ate at their Poolside Restaurant. One night we dined at Duke’s, which was next door to the hotel. I remembered eating at Duke’s in Honolulu, as well as in Huntington Beach. One evening the hotel presented a torch lighting ceremony on the grass between the pool and the beach. After several young well-built Hawaiian men went around lighting the torches, some attractive young Hawaiian women did a gracious hula dance – all very lovely. Each year the Marriott offers a very attractive insulated mug for $20, and during our stay this could be used for as much non-alcoholic drinks as we desired, such as iced tea, coffee, soft drinks. Also it is a nice souvenir. The hotel is smart in putting the year on the mug, so a person can’t re-use it another year and expect the same service. Louise, Kay, and I went to some of the same scenic areas that I’d described in Main Performance Magazine’s spring issue – Waimea Canyon and the Menehune suspension bridge – so I won’t tell you about those this time. An additional spot we visited this year was the Spouting Horn blowhole by the ocean. It has a dual-lava tube which breathes air, making an eerie dragon-like sound, while the other tube shoots a powerful spray of salt water into the air, sometimes as high as 30 feet! Quite a sight! One day while taking a walk near the beach, I ran into two men that I had been used to occasionally seeing during my regular morning walks in the Galleria at Tyler (in Riverside) – what a small world! Saturday, our check-out day, had come before we knew it. Louise and Kay would be flying back to Riverside on the “mainland” in the morning. 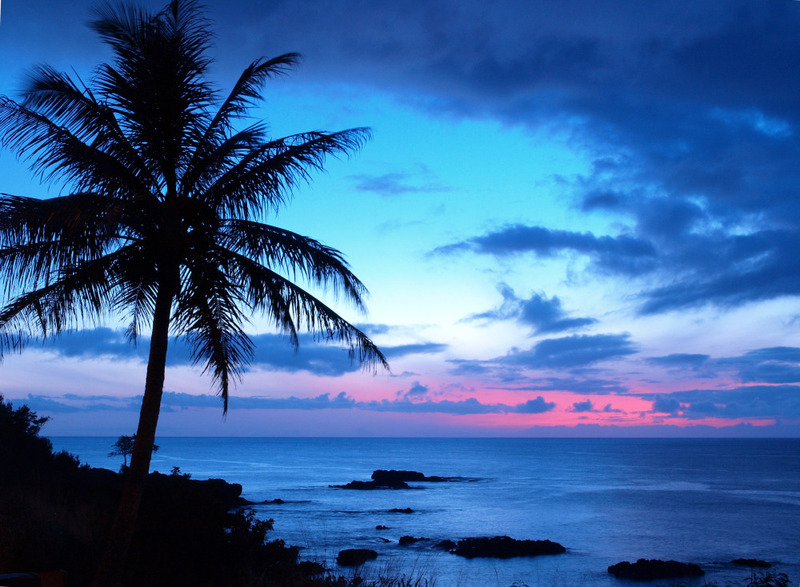 And later in the day I’d be flying to the big island of Hawaii to visit my daughter Susan. I thanked Louise for a wonderful visit and said good-bye to her and Kay. I still had about four hours until my departure on the airport shuttle, so I had some lunch and sat by the beach until then. Susan was waiting there in the baggage area when I arrived at Hilo’s air terminal, and it was good to see her again. Susan had asked me earlier on the phone if I’d like to go to the Aloha Festival being held in Hilo that evening. I said I would, so we drove there first. Hilo’s main street was mobbed with people and the excitement in the air was contagious. We stopped at many of the booths and I even bought a couple of small items. We then started out for Susan’s house. It was one that she’d recently bought and moved into, so I was anxious to see it. The house was one of many which had been built years ago for the workers on a sugar plantation. There is no more sugar plantation, and now the houses are individually owned. As I’ve noticed in many homes in Hawaii, the living area is upstairs, and so it is with hers. Although there are also rooms on the ground floor next to the carports, these are now mostly used for storage, but could later be used for other purposes. That first day we drove over to the other side of the island – where Kona is. After shopping at Costco, we stopped and walked through the luxurious Hilton Hotel where we watched some of the hotel guests feeding the friendly dolphins in their spacious pool. During the week while Susan was at work, she left me her Jeep Cherikee to use as I wanted. And she would ride in with her friend Gerard. I visited some of the scenic areas in and near Hilo and a couple of days I had lunch with Susan. And of course I did some shopping. One day, I visited Hilo’s farmers market, where the friendly vendors were glad to explain what some of their home-grown fruits and vegetables were. Then I revisited the Tsunami (tidal wave) Museum, and am amazed at the tremendous destruction and loss of lives that the tsunamis have caused on several occasions in years past. I learned that this phenomenon is actually caused by earthquakes thousands of miles away. During my week there, we had quite a bit of rain, but it never lasted long before the sun was out again. I was told that because Hilo is on the windward side of the island, we should expect rain, but the leeward side – where Kona is–is, for the most part, dry. On Saturday, my last full day there, Gerard planned to drive us to the volcano where we could observe the lava flowing into the ocean. We left early in pouring rain, which had slacked off by the time we got to where we parked the car. Gerard pointed out the large sprays of steam coming up from cracks in the hardened lava all around us. As we walked over this hardened, uneven lava, the rain began pouring again and the wind, which was constantly changing direction, blew even harder. This, coupled with the steam sometimes enveloping us, cut our visibility to almost nothing! Gerard had brought along a garden rake, I think to poke at the lava, and when I found it difficult to walk on the very uneven hardened lava, he gave it to me so I could steady myself and keep from falling. Susan had walked off into the steam, and when a man nearby said she shouldn’t have gone there, I became worried and so was relieved when she re-appeared a few minutes later. Gerard said we should head back to the car, and now that I was soaked to the skin, I was glad to get in out of the harsh weather. Even so, it had been an overwhelming experience, and I’ll look forward to re-visiting that site on another visit, hopefully on a sunny day. We stopped on the way back to the house for a very delicious and filling breakfast at Ken’s House of Pancakes in Hilo – delicious scrambled eggs mixed with sausage, hash browns, and pancakes with coconut syrup. Also on the way home, we stopped by the bay (Hilo Bay) to visit with some of Susan and Gerard’s friends who were having a sale to raise money for their Molokai to Oahu canoe races coming up soon.